This year there are three gun deer hunting periods instead of the traditional one. All three are in effect along the Chippewa County portion of the trail. Public awareness of the first season, which is currently underway, is low, and it took us by surprise as well. If you want to hike this weekend on the trail, head either east or west: no other northern county is affected by this special hunting period. If for some reason you find yourself on the trail, wear orange! It will be hard to top our September Trail Improvement Day. Lots of helpers, gorgeous weather, the satisfaction of a job well done. But we try. Next Saturday, Oct. 24, you can share some of the enjoyment of lopping brush and cutting branches as we continue our march eastward near Harwood Lake and Mud Brook. 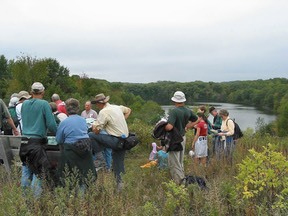 Meet at 9:30 AM at the Chippewa Moraine Visitor Center. Bring your lunch and water, wear hiking or work shoes, and serious work gloves. Stay till mid afternoon or leave earlier if you need to. BUT, PLEASE CONFIRM if you plan to attend by email to chapter@iatchippewa.org. If you have volunteer hours to report from 10/1/2008 through 9/30/2009, please send them in immediately. Think about any time spent on chapter work that wasn't recorded as a group on a sign-in sheet. A good example is individual hours spent in trail maintenance as an adopt-a-trail volunteer. Thanks to all who have sent in their hours. Send your reports to chapter@iatchippewa.org.